Looking for a great activity for a birthday, anniversary or team building exercise? Have a group of 10 or more? 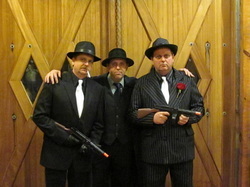 Consider booking a Private Murder Mystery Night Party ! 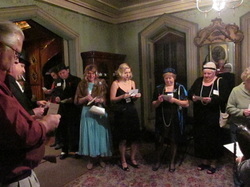 Dust off your flapper dress, zoot suits and Tommy guns and get ready for your Roaring Twenties Murder Mystery Party! At the height of prohibition, morale was high, morals were at an all-time low, and most of the country was controlled by the Mafia. At this cozy little hot spot, hidden in the old Tinker mansion, you will find the best night scene around. Drink, dance, sing and mingle with other like-minded individuals but be careful, wherever there is liquor there is always the mafia…and the police. On a night like tonight, with tensions running high, you might get caught in the middle of a bloody dispute. Enjoy your night but keep your guard up, we’d hate to lose any of our clientele! Tickets will NOT be mailed. Upon arrival, please give the name of the purchaser.